After the record-breaking year in 2015 ended, many in the industry asked: “How are we going to make 2016 better?” Not surprisingly, there continues to be major growth opportunities in the power and use of mobile devices and apps. As a key area of development for hotels, they will need to find ways to further innovate to better connect and deliver a more personal and localized experience for their mobile guests and meeting planners. So how can hotels combine mobile, local and personal with anything, anytime, anywhere? To start, they can leverage live messaging in their hotel apps to better connect with guests throughout their journey. In May 2015, Marriott launched a mobile request messaging feature specifically designed to enable guests to make requests for services and amenities from the Marriott app. The “ask anything, anytime, anywhere” feature offers two-way messaging so guests can chat and make requests, no matter what time or where they are. This innovative, yet common sense feature provides both the guest and the hotel the opportunity to further deepen their relationship which promotes loyalty, revenue and goodwill. The added bonus? Because this conversation takes place within the app, and not over the phone, there is an auditable record of what requests were made so that the hotel can further personalize their services in future. Similarly, high-end hotels like the Wynn in Las Vegas are delivering a personalized service for their guests. During times when staff members aren’t reachable, guests can turn to an app-driven iPad specially designed to function as an on-demand personal concierge. The iPads, which are handed out to guests during check-in, allow them to have a dialogue via live chat and make requests in the same way in which they would with a human concierge, such as: room service, spa appointments, area information, etc. 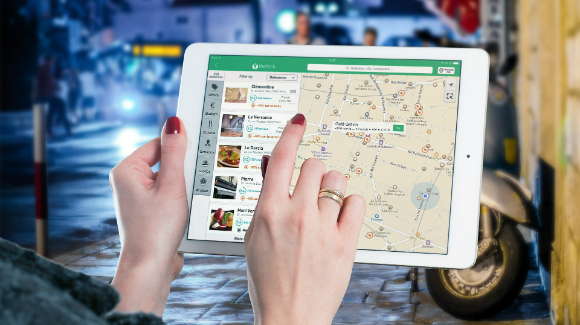 In the age of the cloud, hosted solutions such as Zuzapp offer hoteliers an affordable way to create and launch a feature-rich, hotel-branded, localized mobile app with two-way messaging as a channel to directly connect with their guests. When guests download the hotel-branded app, they are inviting the hotel into their mobile lives. For on-the-go guests, this means being able to simply tap once on the app to be instantly connected via two-way messaging with the hotel. This differentiation over other texting solutions is huge for both user adoption and user experience. With the app, they don’t have to find the hotel’s mobile number, key in the digits or pay for texting. This simple difference can go a long way with securing a favorable and desirable experience for the guest. With the majority of travellers carrying mobile devices, hotels should use two-way messaging to communicate with their guests throughout the entire journey. Similarly, with the majority of meeting planners carrying mobile devices, hotels can use two-way messaging to communicate with meeting planners during their event to help capture, track and fulfill requests from a variety of categories such as food and beverage, audio/visual and others. Requests are routed to appropriate property team members for action, response and closure back to the meeting planner. Geo-targeted push notifications: Deliver personalized, relevant, captivating and actionable pop-up content right to each guests’ smartphone. Mobile offers: Build satisfaction and generate more revenue from guests, conference attendees and local residents with actionable mobile deals, packages and specials. Loyalty rewards: Foster loyalty and reward guests and local residents for making frequent visits and purchases at the hotel, restaurant, spa and retail outlets. Call-to-action features: Digitally prompt guests to leave a TripAdvisor review, book a room, redeem an offer, share a deal with a friend, and attend an event. Virtual concierge: Provide guests with direct access to local and property-specific services including room service, concierge services, spa offerings, golf reservations, on and off property restaurant reservations, area attractions, valet and bell services, resort and nearby shopping, and stunning resort visuals for guests to explore. Today’s mobile guests expect to be able to instantly connect with their preferred hotel brands. Hotels that don’t enable their guests to communicate with them via their preferred channels are missing out on opportunities to forge long-lasting relationships. Leveraging two-way messaging in tandem with innovative hotel mobile app features enhances the guests’ entire journey resulting in happier travellers, greater loyalty, and better reviews. Tony della Busa is co-founder of Zuzapp. Zuzapp provides mobile guest engagement and messaging solutions to the finest hotels, restaurants, non-profits and businesses of the world. Customers include brands such as Marriott, Hilton, Westin, Hyatt, Holiday Inn, InterContinental, Crowne Plaza and Aston Hotels & Resorts, as well as independent brands such as Flamingo Resorts, Desert Palms, Porto Vista, and Eden’s Resort. For more information, visit www.zuzapp.com. This entry was posted in Corporate Travel & Incentives, Event Operations, Social Media & Technology, Travel Tips & News and tagged applications, apps, device, hotel, hotelier, mobile.